I just painted through sunny, cloudy, and rainy weather all in one four day stretch. I didn’t care. I stayed close to Great Salt Bay in Damariscotta, Maine, loving every minute. 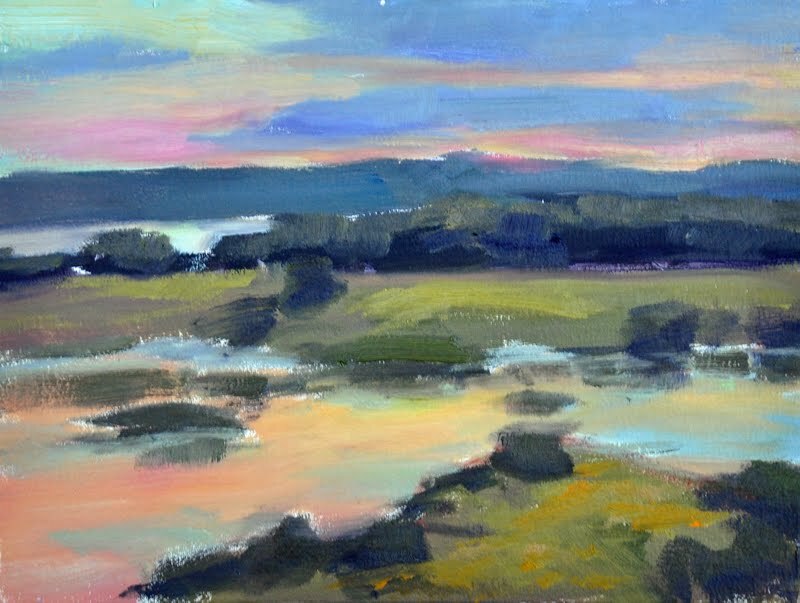 The next evening I painted a pond and meadows as the sun set behind the distant ridge. I love August ! There is a deep summer atmosphere going on. Even on a misty showery day it is very subdued. I stayed near my car in case the clouds decided to drop a lot of rain. It was bright, and the air was thick with moisture. The clouds moved steadily overhead. It sprinkled for a few minutes. I kept painting, laying in the muted soft colors I saw in the meadows, trees and distant ridge. Every now and then the sun poked through so I kept my hat on to prevent a sun burn. By mid-morning I finished a painting of the hilly meadow with the trees. Great Salt Bay Farm has a mile of waterfront. Walking trails cross all over the property. I planned to walk down to the shore to paint, but it started to rain. 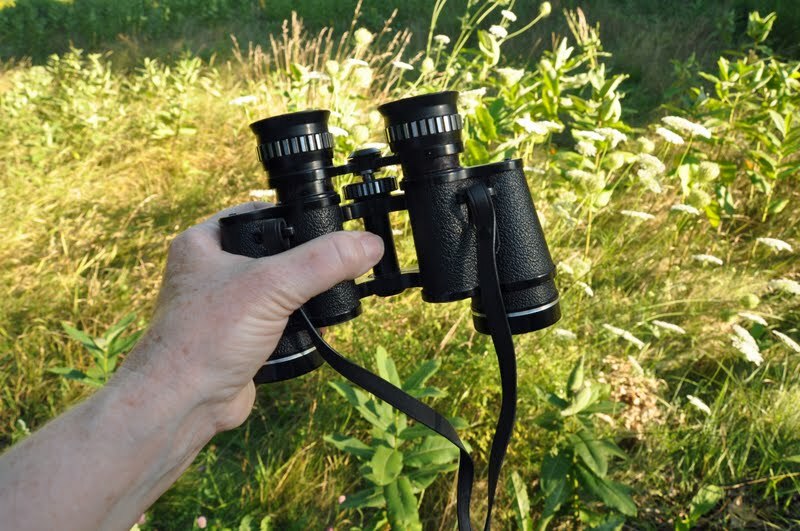 I always carry my binoculars with me….so out they came. They are so handy in a situation like this. I could paint my chosen subject and stay right next to my car ! I worked on the composition by painting in all the masses of trees, bushes and grass and leaving my lightest water and distant shapes unpainted. as interesting arrangements of shapes, lines and masses of different colors. A visitor ! My best friend Libby arrived bringing a basket of blueberries hoping I would pause and have lunch with her. It’s not raining, therefore a perfect time to sit and munch. Then it’s back to the binoculars and paint brushes. I look through the binoculars and stare intently at the trees. I memorize what I see. I put the binoculars away and paint. Gustav Klimt did this for some of the landscapes he painted. That’s where I got the idea. 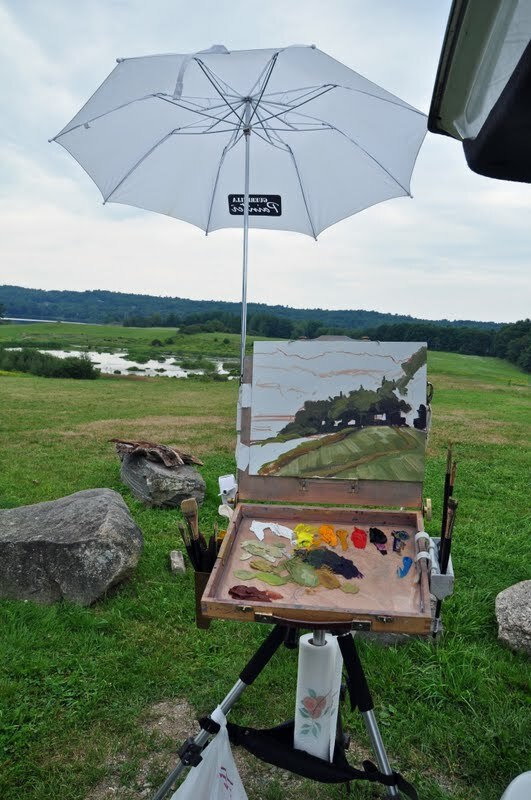 It’s still threatening to rain, but I know I have go paint at Oyster Creek before I pack up the brushes for the day. I park near the bridge looking up the creek at a farm on the distant bank. It is getting late now and I know I have to move fast on this one. I sketch in the shapes on a 16×20 panel. The tide has turned, it is just starting to go out. I mix a batch of colors. I place the color notes and values, picking and choosing as I go, painting with a large brush so I can get this scene down fast! This creek is way up at the top of the Great Salt Bay. It’s tidal but the land around it looks more like inland Maine. It’s almost evening but I still have enough light from the high overcast sky. I like the feeling of this open expanse of water. I wish I was painting this view on a bigger panel so I could put in more details . The breeze started to pick up and create patterns on the surface of the water. Is this a sign of rain coming? I put in a few more colors, packed my car and hit the road. I have enough blocked in to finish all these paintings in the studio. And I’m coming back here to paint in October… guaranteed!